Pillows are an integral part of our sleeping comfort as they contribute to 20% of overall contentment. A good selection can provide relief and partial recovery from physical symptoms, while an ill-suited pillow may exacerbate existing conditions and potentially create new issues. Use our buying guide to ensure a good night’s sleep and a tension-free neck. Each individual has their own sleeping style. While a neutral alignment is recommended, consider how you wake up every morning and your position when you fall asleep. Back Sleepers require thin pillows so their head is not always in an uncomfortable position. Side sleepers should choose a firm, high pillow to bridge the negative space between their ear and shoulder. Stomach sleepers need a flat pillow; high pillows can cause headaches and reduce essential REM time. The right pillow height will rely on your body position. If the pillow is too thin, you run the risk of compounding your shoulders. If the pillow is too thick, your ability to breathe may be affected, producing a snoring concerto nobody loves to hear. Ideally, a pillow should position the head on the pillow at a height of four to six inches. Today, the choice of pillow fillings may feel endless, as new combinations and posturepedic alternatives complicate your final decision. Make an informed purchase. Feather Filled Pillows: Duck feathers are still used to stuff pillows, providing a natural alternative to synthetic materials. Feathers are mouldable, meaning they will move with your body, lasting longer than rigid fillings, but are not recommended for people with allergies. Synthetic Filled Pillows: Synthetic usually refers to polyester, a resilient manufactured material used to produce budget friendly pillows. 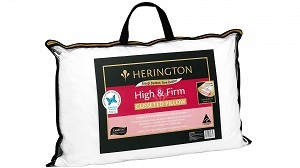 While it is possible to find different heights and types, synthetic pillows should be replaced more often as they lose cushioning power over time. Wool Filled Pillows: Wool is a breathable, machine washable and fire-resistant fibre with a natural absorbency. Wool fillings are bouncy and firm, ideal for back sleepers; most wool pillows are cross layered and woven to minimise lumpiness. Thickness and height can vary according to your needs. 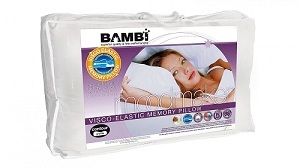 Memory Foam: Memory foam is made with a polyurethane that material retains the shape of your normal sleeping position. A good memory foam pillow will maintain the shape of your head for hours after you’ve moved. Standard: Most pillows conform to the standard measurements of 20” x 26”. Standard pillows support the neck, shoulders and head, maintaining spinal alignment and encouraging a healthy sleeping position. Standard pillows come in a variety of heights and fill types. Contour: Contour pillows are usually made from foam, memory foam or latex; the basic shape cradles the head and supports the neck. This provides spinal alignment and relives tension. Body: Body pillows typically measure around 20” x 54”. The length of your body is cushioned and supported during rest by its unique design and shape, making the body pillow a good accessory for side sleepers. European: European pillows are often seen in decorative displays. A perfect square, the European pillow measures 26” x 26” and serve as added support for all sleeping styles. Travel: Travel pillows come in two basic shapes, rectangle and kidney. Kidney pillows curve around and embrace the neck, while rectangle travel pillows are smaller versions of those found in your bedroom. 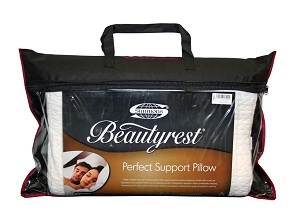 Nursing: New mothers and their babies benefit from the curved and comfortable support of a nursing pillow.